Dymatize is one of the standard bearers when it comes to protein supplements, and the company's products boast a sharp new look to go with their storied past. Dymatize produces a diverse array of sports nutrition products, but for many of our readers and customers, the company is synonymous with whey protein isolate. The company's ISO 100 has had the "Isolate Protein of the Year" category on lockdown for four years running in the annual Bodybuilding.com Supplement Awards, which tells us you love it and love the results it provides. Sit down with a rep from virtually any supplement company, and within minutes they will champion their company's dedication to science. Dymatize actually walks the walk, with a research team led by supplement expert and Bodybuilding.com contributor Robert Wildman, PhD, RD. The Dallas-based company has also raised the educational bar for supplement companies by leading three in-depth Bodybuilding.com Expert Panels, dealing with topics ranging from protein, to 24-hour nutrition, to overall nutritional optimization. It also sponsored one of Bodybuilding.com's most popular workout-and-nutrition programs, "Transformed: 12 Weeks to Your Best Self." Rather than get comfortable, though, Dymatize is in the middle of a comprehensive rebrand of its full line of research-backed sports nutrition products. I connected with general manager Marc Mollere to discuss this sleek new look, as well as the brand's past, present, and future. Marc Mollere, Dymatize's general manager, is committed to protecting and honoring athletes through quality products. What's new at Dymatize that excites you the most right now? We believe 2017 will be one of the most exciting years in our 20-plus-year history. We are in essence rebranding our products with new, premium packaging, starting with ISO 100, Elite 100% Whey, and Super Mass Gainer. We're moving into new headquarters in one of the fastest-growing neighborhoods in downtown Dallas.The neighborhood is a good reflection of our energy and our culture. We also have a robust new-product development pipeline as well. Recently, we launched new Elite protein bars and ISO 100 Clear Protein Drinks, both of which are important protein products for our fitness audience. We wanted to make sure our customers could get Dymatize proteins whenever they wanted. We take tremendous pride in our in-house flavors, which are developed by our food scientists. Our fans can expect to see some great new flavors on our flagship brands this year, too. You mentioned the rebranding. What's the goal there? In 2015, we stepped back and took a hard look at our brand. We knew we had some of the best-quality protein products on the market, but the packaging and our message weren't really reflecting our commitment to quality and the industry as a whole. We wanted our brands to look and feel like the superior products they are. So, we did a lot of work to identify what our brands stand for, and we honed in on qualities like authenticity, trust, quality, cleanliness, and efficaciousness. We have a longstanding commitment to protecting and honoring athletes, so we want to make sure our packaging represents the clean, scientific product formulations. Science and quality play a big role in our product-development process. Consumers have told us the new packaging feels clean, athletic, and strong. It also supports our belief in being transparent about our ingredients. Since the new packaging has been introduced, we've been getting great feedback. We think it's a big improvement, and we're excited about all of the Dymatize products getting this new, upgraded packaging. Our new packaging is clean, it's athletic, and it's strong. Now that it's rolling out, we're receiving great feedback. We think it's a big improvement, and it's exciting to imagine all of our Dymatize products looking the same way. 4G Or More Of Bcaas Proven To Help Build Muscle And Aid Recovery! Your new tagline states, "Dymatize: perfecting athletic nutrition." What does that mean to you? The people who use our products invest a tremendous amount of time and energy into their fitness regimens. We wanted to bring attention to the fact that these people are real athletes, and what they do requires tremendous discipline and effort. It takes real commitment to lift every day, to compete, to train yourself, and to build your best body or improve your overall performance. We also know there is some skepticism about the sports nutrition industry, so we ensure that our product formulations are based on science. We wanted people to think about our industry and brand in a new way, to go beyond sports nutrition as we know it today. Dymatize is Athletic Nutrition, and we endeavor to perfect athletic nutrition in our products. Physique competitor Mike Hildebrandt, one of the stars of Dymatize's "Transformed" trainer, is just one of many athletes representing the company's brand story. As you mention, there's a perception that supplement manufacturing is just people throwing ingredients into a bottle. 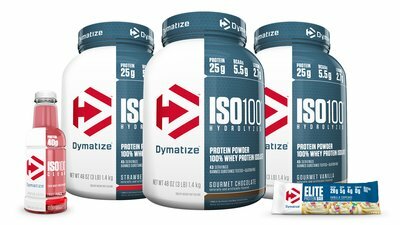 What does Dymatize do to make sure what's on the label matches what's in the product? I believe that one of the most important questions someone should ask themselves when selecting a sports nutrition product is, "How do I know the product I'm choosing is legitimate, safe, and effective?" Dymatize has extensive testing protocols in place, not only during manufacturing but also after production. We are extremely particular about the ingredients that go into our products, and we test each one for their nutritional value and efficacy. We produce only in GMP (Good Manufacturing Practice) and sports-certified facilities, so our athletes can be assured that our products are validated clean, safe, and free of banned substances. GMP is a system for ensuring that products are consistently produced and controlled to quality standards. Then, our products go through additional testing with Informed Choice, a quality-assurance program specifically for sports nutrition. We also think it's important that 100 percent of the protein claim per serving is derived from high-quality, pure, intact proteins; we don't add amino acids to increase the stated protein content. We were talking about the rebranding initiative earlier, and if you look at our new rebranded labels, you'll see sections titled "Real Science and Quality" and "Dymatize Protein Ethics." Those sections explain exactly what we're talking about; we want to give our athletes the confidence that when they purchase a product from Dymatize, what's listed on the label is what's in the bottle. What do you consider to be your flagship products on Bodybuilding.com? ISO 100 Hydrolyzed 100% Whey Protein Isolate is clearly our flagship product. We are thrilled to have been chosen as the "Isolate of the Year" on Bodybuilding.com four years in a row, because the voting is done by people who use these types of products. I think that speaks volumes for what Bodybuilding.com shoppers think about ISO 100. We are proud of our leadership and our heritage in the protein category. We've worked hard to provide consumers with high-quality, efficacious, and great-tasting products for over 20 years. At the same time, we are looking to bring new products to market. What's made us successful is having an in-house team of R&D and food scientists who make sure we're selecting the best ingredients and flavoring systems to provide an excellent finished product for our athletes. To have other successful products, we need to make sure we're providing the consumer with a superior solution like we've done with proteins. We intend to do that, so expect some big innovation in 2017. Are there any new product launches coming down the pipe? Earlier, I mentioned our new Elite Protein Bars and our ISO 100 Clear Protein Drinks. We just launched five flavors of the Elite Protein Bars, and three flavors are currently launching on the ISO 100 Clear Protein Drink. They are just hitting the market. So for now, our focus is making sure that the rebranding and the new packaging is working, and that these new convenience-focused protein products are available to all our consumers...but there is more coming. In the near future, we'll launch a couple new flavors of ISO 100. One of this year's new flavors is on Bodybuilding.com right now. It's Rocky Road, and it's exclusive to Bodybuilding.com. We have several other product initiatives in development, but it's too early to discuss them. It all boils down to what I said earlier: Dymatize has a big 2017 teed up, and we're excited and energized about the rebrand, innovation, new flavors, and more. You have a diverse range of athletes representing your brand, many of whom we have the pleasure of working with for content creation. What common denominators do they share? Our athletes are part of our brand story, and we look for men and women who are putting in the work. We bring real people who are living a fitness-inspired life onto our team, from competitors in bodybuilding to participants in other athletic endeavors. For instance, we have Heather Hardy, an undefeated world-champion boxer who is at the top of her game. We have Michael Chandler, who is a champion MMA fighter. We have powerlifters and personal trainers, and then we have physique athletes like Brandan Fokken, Mike Hildebrandt, and Brooke Erickson. It's important for us to show how everyone can benefit from training and the right nutrition. In your mind, who is the typical Dymatize consumer? Our typical consumer is doing some type of exercise or hitting the gym on average 5-6 days a week. These people are very serious about their workouts. They also understand how to use supplementation strategically. So, any athlete who uses nutrition to support their training is our typical consumer.